A new computer modeling study shows that corn yields improved under diversified rotations versus corn grown in monoculture. The study, funded by OMAFRA’s New Directions program in collaboration with Agriculture and Agri-Food Canada (AAFC), looked at the effectiveness of the DeNitrification-DeComposition (DNDC) model in capturing the beneficial impacts of diversified cropping systems over time. University of Guelph professor Claudia Wagner-Riddle, who led the study along with her colleague Marek Jarecki in the school of environmental sciences, says the study used data from two long-term trials with contrasting soil types: a 35-year trial at Elora and a 57-year trial at Woodslee. 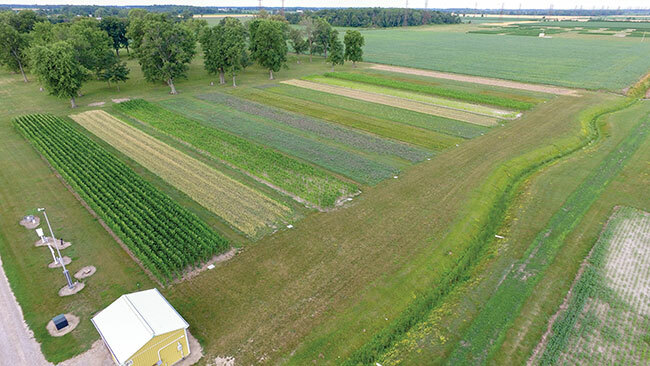 “Our objective was to test the ability of the DNDC model to predict changes in yield as well as soil organic carbon, and to be able to do that you need long-term plots,” Wagner-Riddle says. The long-term trial at Woodslee is supervised by AAFC researcher Craig Drury while the trial at Elora is supervised by University of Guelph researcher Bill Deen. According to Drury, modeling work like Wagner-Riddle’s is indirectly invaluable to Ontario producers. Wagner-Riddle says studies that consider climate impacts in the future are especially important in helping to make cropping systems more resilient to extreme weather events. She says the climate community has created scenarios that consider possible climate situations in the future. These are called representative concentration pathways, or RCPs, and they take into account three possibilities: that nations around the world don’t reduce fossil fuel use and C02 levels reach very high concentrations; that concentrations stay at a medium level; and that concentrations hit a low level. Using data from the two long-term studies, Wagner-Riddle’s team first validated the model and then projected it into the future, ending at the year 2100, to explore how monocropping and diversified rotations, respectively, responded to these different RCPs. What they found, says Wagner-Riddle, was that diversified rotations were more resilient to climate change. “They were able to deal with climate change and yields increased, while in the simple rotations, yield stagnated due to water effects,” she says. Drury says the trial at Woodslee has generated “an absolute goldmine” of data. 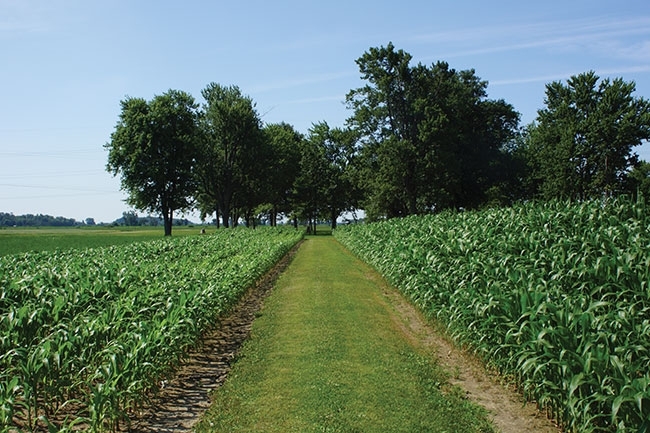 The study involves 12 treatments, he says, with half of these fertilized and half left unfertilized; plots include continuous corn or a four-year rotation with corn: corn-oats-alfalfa-alfalfa (with the alfalfa underseeded to the oats in the third year). He says that in the continuous corn treatments the soil has degraded over time, and researchers have observed many other problems. In a good year, the crop reaches about knee-high. Yields have remained flat for these plots, he says, because researchers have introduced better varieties over time. “In contrast, in the rotation treatments, the soil quality is so much better than continuous cropping, such that the yields have generally increased over time, and the soil properties are improved – higher carbon levels, improved physical properties, better drainage, improved water holding capacity,” he says. Over a 57-year period, average yields in the continuous corn (fertilized) are roughly 95.2 bushels per acre (bu/ac), and average yields in continuous corn (unfertilized) are roughly 21.7 bu/ac. But yields in the fertilized, rotated plots reach 131 bu/ac on average. Averages calculated based on eight years of data from 2008 to 2015, reflecting current population rates and row spacing, show that typical yields for fertilized, rotated plots reach 158.9 bu/ac versus 103.3 bu/ac for fertilized continuous corn plots. Drury says the improved yields and soils in the diversified rotations stem in part from the use of cover crops in the “shoulder seasons” – spring before planting and fall after harvest – and that the inclusion of a cover crop or winter cereal crop in the rotation, such as winter wheat, can make a big difference. Long term impacts can be seen from these studies, but what about the short-term, in which farmers make decisions based on practical factors and return on investment? Wagner-Riddle is working on another modeling study looking at the short-term effects of a diversified rotation, including effects on yield, soil organic carbon, nitrous oxide emissions and water quality. But data already exists showing real benefits to diversified rotations. Drury is the lead on another study looking at continuous cropping with corn, soy or winter wheat, or two-, three- or four-year rotations with either winter wheat, or winter wheat and a red clover cover crop.